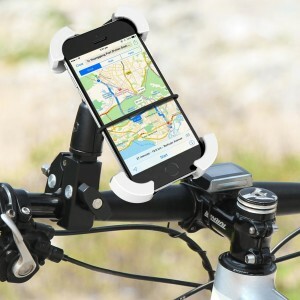 The 1byone universal cell phone bike mount is great for holding your phone while having a map or fitness tracker app open for when you hit the trail or pavement. I give this bike mount a 5/5 rating. The part of the mount that grips onto your phone or GPS is made of plastic. The plastic feels thick enough to hold up to normal use; however, I would suggest not leaving the mount on the bike if you do not park the bike inside. That way the plastic does not dry out and become brittle. After all, the mount is holding your precious device. I have a SAMSUNG GALAXY S5 in a SPIGEN SLIM ARMOR CASE. The phone was easy to insert into the mount. I shook the mount vigorously and the phone stayed tight in place. Compatible with any 3.5-5.5 inch smart phones & GPS device. Suitable for 15-35 mm diameter handlebars. Tight gripping corners and elastic band ensures secure protection. 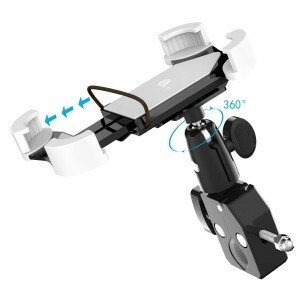 Can be adjusted to horizontal and vertical viewing angle. Strong Compatibility: Compatible with almost all smartphones and & GPS ranging from 3.5-5.5 inch, fitting for a great variety. Multiple & Secure Protection: Special designed tight gripping corners and extra elastic band securely protect your device while you ride. What ¡s more, super soft rubble inside prevent your device from damaging and slipping. 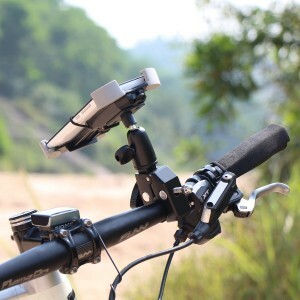 Versatile & Highly Functional: With 360° rotation, the bike mount can be fully adjusted for quick portrait and landscape view and to best angle you want. Easy Installation: Easy operation and tool-free installation highlights simple style and supply you a better mounting experience.